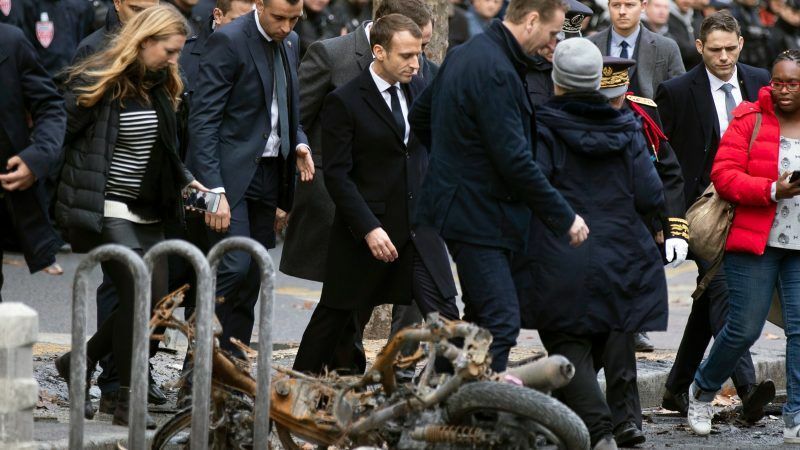 Macron held crisis talks with the prime minister, interior minister and top security service officials to forge a response to the violence that left hundreds injured nationwide. Prime Minister Edouard Philippe has been asked to meet protest organisers and party leaders as part of a “constant wish for dialogue,” the Élysée Palace said. Environment Minister Francois de Rugy met representatives of the “yellow vests” last week but failed to convince them to end the protests. The government has not ruled out imposing a state of emergency to combat the protests, which began over fuel taxes but have grown into wider anger over Macron’s agenda. The president earlier assessed the damage at the Arc de Triomphe, the massive monument to France’s war dead at the top of the famous Champs Élysées avenue, where rioters scrawled graffiti and ransacked the ticketing and reception areas. Inside, rioters smashed in the iconic face of a sculpture, a partial reproduction of the victory allegory “La Marseillaise” by Francois Rude. A total of 263 people were injured nationwide, with 133 injured in the capital, including 23 members of the security forces. Overnight a motorist died after crashing a van into traffic which had built up due to a “yellow vest” demo in Arles, southern France, a local prosecutor said Sunday. Three people have now died in incidents linked to the protests. The anti-government protests that have swept France were sparked initially by a rise in taxes on diesel. Around famous areas including the Champs-Élysées, the Louvre museum, the Opera and Place Vendome, smashed shop windows, broken glass and the occasional burned-out car were testament to the violence. Some 136,000 demonstrators, most of them peaceful, were counted across the country on Saturday, the interior ministry said Sunday. The figure was well below the first day of protests on 17 November, which attracted around 282,000 people, and also down on the revised figure of 166,000 who turned out last Saturday. Interior Minister Castaner attributed the violence to “specialists in destruction”. Over the last few weeks, the “yellow vest” movement has morphed into a broad opposition front to Macron, 40, a pro-business centrist elected in May 2017. Violent anarchist and far-right groups have infiltrated it and are thought to be behind Saturday’s clashes. Macron faces a dilemma in how to respond, not least because the “yellow vests” are a grassroots movement with no formal leaders and a wide range of demands. “It’s been 30 years that people change course every 18 months,” he added, referring to Macron’s predecessors who have often caved in to pressure from French street protests. And he remains a fervent defender of the tax cuts he has delivered for businesses and the wealthy, which he believes were necessary to lower chronic high unemployment. Opposition politicians condemned the violence but also criticised the government’s response. 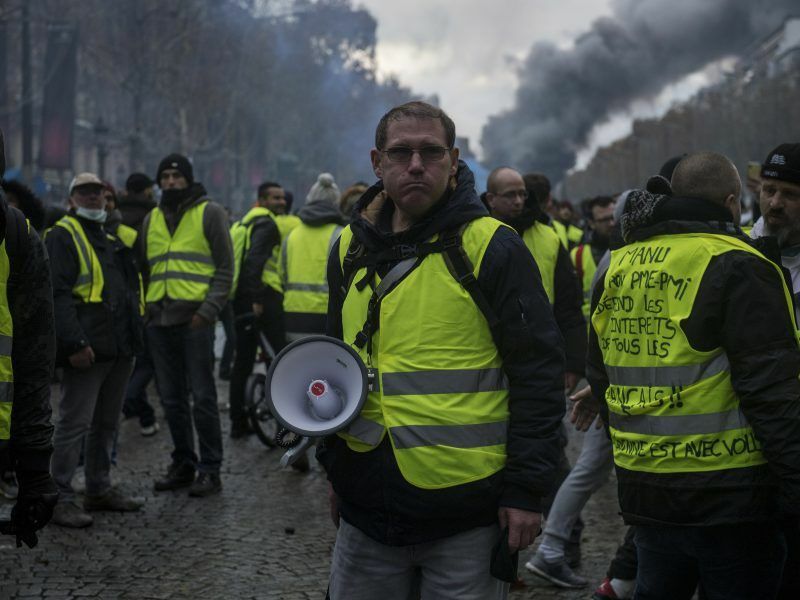 “The government is not entitled to a third black Saturday,” said Senate President Gerard Larcher, amid warnings that protests could resume in Paris next weekend. Far-right and far-left leaders Marine Le Pen and Jean-Luc Mélenchon called Sunday for new parliamentary elections. Despite the violence, opinion polls suggest that two in three French people back the protests.